I had a bit of bad luck, which led me to buy a RTS II. I’d just about finished collecting all the Meyer-Optik lenses I wanted in M42. And on the brink of my victory, the M42 body I had rolled over and died. I shouted “KHAAAAAAAANNN!” at the heavens, and then went looking for a replacement. I failed to find a good, cheap M42 body. Nikon to M42 adapters are iffy. The Spotmatics mostly had dead meters, and the ones that didn’t still required a battery modification. I sighed, resigned myself to dropping $400 on a Bessaflex, and started saving up. 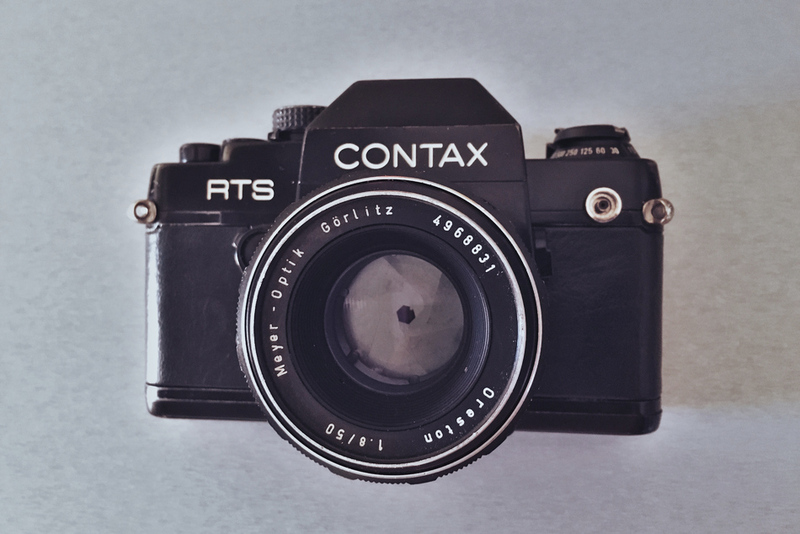 Along the way, I happened across a Contax RTS II body for $100. I stopped long enough to make sure I could get an adapter and bought it. It showed up from Japan in good shape. The body had brassing, it was obviously a user, but the light seals were brand new, and that’s a big consideration in an SLR of this age. The leather looked good. I put in the battery and the Kipon M42 to Contax/Yashica adapter and grabbed a couple of lenses to go shoot. 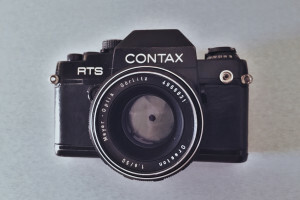 The RTS II was the Contax flagship professional SLR in the 1980s until replaced by the III in 1990. I had looked at buying a III, but it seemed to have some features I felt were problematic, like the vacuum system to hold the film flat. I liked a little less automation in my camera bodies. The RTS II offered the same level as my beloved Nikon F3, which it was a direct competitor of. Apparently, I am the target demographic of SLR manufacturers circa 1986. Too bad I was flat broke in those days. The RTS II is smaller than the F3, and handles a bit differently. It’s not an unpleasant difference, it’s just noticeable. It does seem to be as robust as my F3, with a titanium shutter curtain and dependable electronics. The shutter is quartz timed for greater accuracy. The pentaprism isn’t modular and can’t be switched out, but you can change out the focus screens if you want. The metering seems to be highly precise, more so than other in camera meters I have used. Although everyone I talked to suggested that the RTS II was more dependable than the I or the III, the only drawback I felt was the fact that repair of the camera seems more difficult to obtain. If something goes wrong with mine, I’ll just have to take it to the local guy and hope for the best. Manufacturer support is long gone. That concern was outweighed by two things: the accessories and the lenses. The system accessories are pretty easy to find and have been fairly cheap. I managed to find a perfectly working W-3 power winder for $19. The remote shutter release for the camera is proprietary, but pretty reasonable. The infrared triggers seem to be hard to find, but I haven’t looked very hard for them. The lenses, though. The lenses that were designed to be used with the Contax line are Zeiss, that magical manufacturer. And the Zeiss lenses in the C/Y mount this camera uses are the least expensive of them all. I plan on getting the Planar 50mm f1.4 of course, and trying the 85mm f2.8 Sonnar. But first, I want the 45mm f2.8 Tessar, because I am addicted to Tessars, and because the camera with that little lens on it will be the smallest SLR outfit I have owned but still extremely capable. I don’t know how much time my RTS II will spend in the back woods, but I bet it will be the choice for portrait work going forward. My little gateway to Zeiss goodness. Previous Post Is that really in your bag? 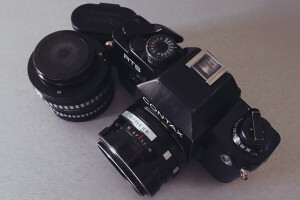 Contax stuff is fine, but it is no Spotmatic. The Spotmatic is perfect, in that once you have spent five minutes working out what the buttons are, it gets out of your way. Everything is where your fingers go, and everything is necessary. As for the meter, you can fit a Wein cell, change it once a year, and stop worrying. I taught a ten year old how to use one yesterday. She was fascinated when I took the lens off and showed her how the mirror flipped up so the shutter could move on, and that you had to wait to see how the film worked. It was a moment of joy. You’ve had better luck than I with Spotmatics. I’ve never seen one with a working meter, battery or no.